Hands are incredibly vulnerable in the workplace and it’s a part of the body that is often actively put into or near high risk areas. 2012/2013 figures released by the Health & Safety Executive (HSE) showed there to be more than 17,400 handling injuries to employees, with 7% being major. Together with data from 2010/11, where it was reported 2,987 workers were “injured through cuts from sharp/coarse material or equipment or from trapped fingers”, it is clear that employees still need to be made aware of the risks and the protective solutions available. In order to reduce handling injuries in the workplace, it’s important that suitable protective gloves are worn. 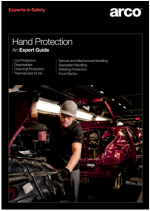 As part of it’s commitment to safety ARCO has produced a dedicated Expert Guide to Hand Protection. The Expert Guide can provide customers with an overview of legislation, EN standards and workplace hazards, to assist in the selection of the right protection for the job.